Japanese Dock Reaches Oregon; Tsunami Debris Arriving Sooner Than Expected : The Two-Way A dock washed away by the March 2011 natural disaster landed on an Oregon beach this week. It is 66 feet long, 19 feet wide and 7 feet tall. 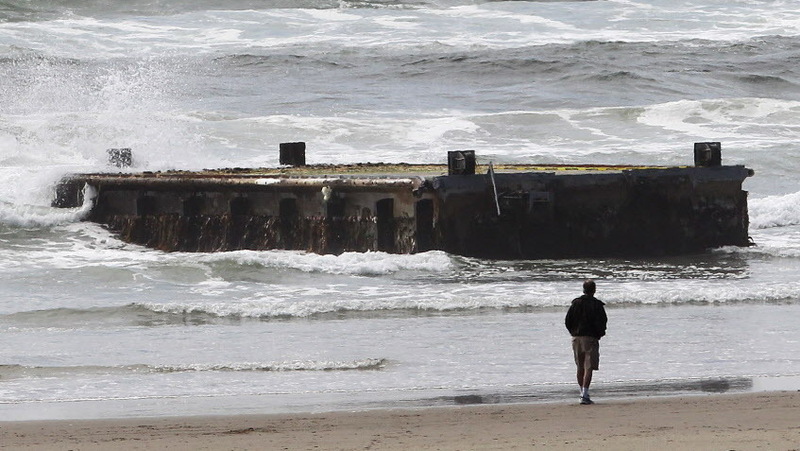 A man looks at the massive dock from Japan that washed ashore on Oregon's Agate Beach this week. "A massive dock" that was washed away from a city on Japan's northeast coast by the devastating March 2011 tsunami landed this week on an Oregon beach. It's a warning sign that dangerous chunks of debris from that disaster are reaching the Pacific coast of the mainland U.S. much sooner than predicted, The Oregonian reports. "This stuff is coming a lot faster than we thought it was," Tom Towslee, a spokesman for Democratic Sen. Ron Wyden told the newspaper. "It's starting and at least nine months ahead of schedule as far as I can tell." As we've previously reported, experts had thought it might be March 2013 before major pieces of debris hit the coasts of North America. According to the Oregonian, the dock that washed up on Agate Beach this week is "66 feet long by 19 feet wide by 7 feet tall." It came from the northern Japanese city of Misawa, according to Hirofumi Murabayahsi, deputy consul general at the Japanese Consulate in Portland. He tells the newspaper that there are three more like that dock possibly floating toward the U.S.
Agate Beach is about 55 miles west of Corvallis, Ore. It's about a 90-mile drive from both Salem and Eugene. Commercial fishermen, as Oregon Public Broadcasting has reported, are very worried about the danger that such debris presents to their ships. In April, the U.S. Coast Guard fired on and sank a Japanese "Ghost Ship" that hd been set adrift by the tsunami and was floating in shipping lanes off Alaska's southeast coast.